great post! ive been meaning to try my hand at DIY, but i havent really gotten around to buying the oils/can't afford them when i think about it. soon though! Thanks, Sylvia, you'll have a great time, I guarrantee it. Earlier this year I bought a phenomenal amount of aromachemicals, absolutes, etc. from The Perfumer's Apprentice (read about it on Perfume Journal and it turned out to be a brilliant place)in part to just have an olfactionary to learn to better identify notes in scents, but also w/ the idea of playing around w/ creating some scents for myself. *Still* have done nothing w/ it due to lack of time, but you've inspired me to go get them out of my closet in the near future and actually start to experiment. You go for it, Elle! I know you'll create something original and beautiful! I have just gone down the same route and am indeed having a marvelous time. Kudos on a delightful and encouraging post! Indeed, some of the failures are spectacular (I JUST started this a month ago), but you learn so much from one of them that it's almost more interesting than a success. Either that, or I'm sick in the head. At any rate, your advice to keep it simple at first is first-rate: it's amazing how fast an appealing blend can turn into a monster if you overcomplicate it. I went into this with ideas about what I would create. The ingredients will possess you if you start down this road, and inspire you. Some of them are heartbreakingly lovely in their own right. You didn't mention the difficulty in care and feeding of absolutes: they are sticky and difficult to measure and will not always incorporate properly with a perfume base (alcohol, or if you don't mind perfume oils, jojoba). Not to worry: dilute them beforehand. You will need an ARMY of bottles, but they are cheaply available. For heaven's sake, don't forget labels. That sounds like something I could really become obsessed with in a hurry! It would be so great to make special scents for all your loved ones and they'd smell like no one else. Thanks Marla I really enjoyed this. I think you've set up my next personal great frontier! Thank you for your kind words, Anthony. 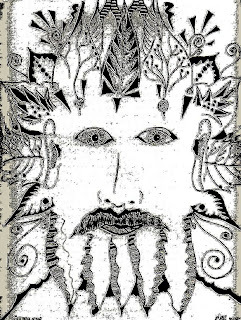 "Green Man" is one of my favorite prints. Thanks for the informative article. This will surely help a lot of us get started with what is probably the natural progression of perfume obsession. I can see myself now, coming up with all kinds of bizarre new smells! Neat drawing, too. Hee. I am an inside-out person, apparently...started first with aromatherapy and creating my own personal scents, and (after some time out) came to perfumista land. When you have the time and the inclination, tinkering around with scent-sual alchemy is a marvelously entertaining enterprise. I whole-heartedly endorse your recommendation to try it, for those who find themselves more than curious. I came to perfumery via the aromatherapy route, too. Though they are as different as raquetball and tennis, there is overlap, and I enjoy and use both. Thank you Marla, for some inspiring ideas! I know of several places where I could get the building blocks of perfume locally, as well as by mail order. I would really like to have a collection of essences both for experimenting and just for the pleasure of smelling them when the need strikes. Loved this post. I've just started blending, and have to agree with all that this is a very rewarding, enjoyable and intriguing practice (obsession is just around the corner, I'm sure). I've had very pleasant transactions with Liberty Natural Products and the Perfumer's Apprentice (both sites mentioned by other posters here). The incredible scents of individual notes are just as pleasurable to experience as the sophisticated blends offered by my favorite commercial perfumes. Instead of having my nose glued to the inside of my wrist, I now walk around waving scent strips in front of my face. I've also had luck with White Lotus Aromatics and with The Essential Oil Company -- stellar service and exquisite products. White Lotus Aromatics has an online newsletter complete with info on natural ingredients and recipes that I've found very enjoyable. More power to your mixing arm! I am so glad you wrote about "DIY". I have well spent every extra penny I have on oils this year. I found great pleasure and madness creating perfumes. I have learned and am still learning the preciousness and precociousness of scents. How one drop too much of ginger or pimento assassinate my work. How one's mans trash may be another's treasure when mixed well. Cognac can frankly smell like fresh bar vomit at first then settle intoxicating as lilac wine. The guilt of ruining a blend and thinking of the care that went into capturing the jasmine that now is being poured with other nobility in the trash. "If I had just restrained!" I flagellate. They can really ascend by becoming familiar with the symphony of notes and how they are obtained. Yes, it's really very much like watercolor painting, isn't it? Like watercolor, once you put that color on the paper, there's no going back. When it works, it's brilliant, and when it doesn't, oh the pain!